Are you ready for the big show? Maisy and her friends show little ones what it’s like to attend their first live performance. Today, Maisy and her friends are off to the theater to see a show starring Flora Fantastica! First they line up to show their tickets. After the usher helps them all find their seats, the lights go down, and Maisy and her friends take in a feast for the senses: dramatic flashing lights, colorful costumes, amazing songs, and lots of exciting characters. 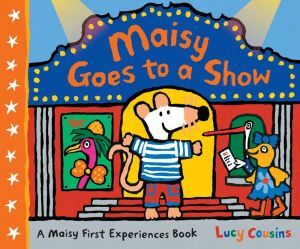 From the rise of the curtain through intermission (and snacks) to a standing ovation at the end, Maisy takes her fans on a trip to the theater that makes a new experience familiar and fun.